SANMARINO CO., Ltd who manage NAVAL contributes sustainability together with I:CO! They expand brands such as BEN DAVIS, TES and B ONE SOUL have started a garment collection at their own stores from April 1. It is the first time to start in Japan for collecting garments by wholesale business by their own stores and are expected to expand a collection to more retail stores in the future. HIROKO KOSHINO will start a garment collection campaign at their stores in Japan cooperation with I Collect Japan from Apr 17 to Apr 30. HIROKO KOSHINO will promote a sustainable activity with I Collect Japan. Participated stores and more details, please see the HIROKO KOSHINO website. 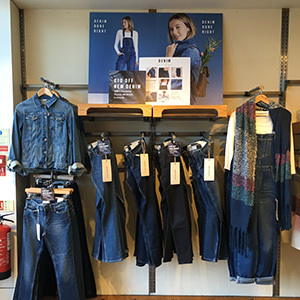 The British retail company FatFace starts a joint takeback initiative with I:CO, the global partner for in-store collection, re:use and re:cycling of used textiles and shoes. Customers of the label can drop their unwanted clothes in every participating FatFace branch in the United Kingdom – regardless of the clothes’ brand. I:CO and FatFace pursue common goals: Reducing textile waste, saving resources by keeping manufactured goods longer in the textile loop, and the protection of the environment. With this cooperation, I:CO keeps expanding its global network. The large amount of waste resulting from the production of sneakers finds a new use in a cooperation of Adidas, I:CO and the designer Simone Post. What happens to sneakers that are thrown away due to wear and tear? Where do they end up? The I:CO company has a creative solution to reuse waste and plastics that would otherwise pollute the environment. 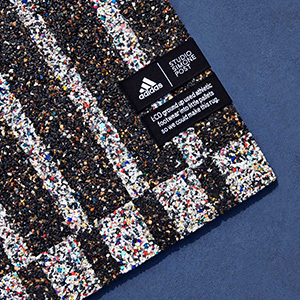 Adidas picks up on this recycling idea applying it to their own sneakers to produce design products whose primary material originates from the rubber of these sneakers. Simone Post, textile and product designer as well as graduate from the Design Academy Eindhoven, was commissioned. She uses the waste products collected by the German company I:CO as primary material – and that is how Adidas rugs came into being. In addition to flexibility and robustness, also the look of the rug was a challenge. At the request of Simone, I:CO subdivided the material into white and black strips to create a graphic image that is reminiscent of the Adidas brand. The pattern showing on each rug can be looked at in two ways. From far away, the black and white pattern is clear and uniform; from close up, one can see the many color elements that once had been part of the sneakers. The result of these tests is a wonderful series of prototypes that show how many possibilities there are to recycle plastics. I:CO Expands Partnership with GUESS?, Inc. I:CO is proud to expand our partnership with GUESS on its wardrobe recycling initiative. The in-store collection program called RESOURCED is now nationwide in the U.S. following a successful California pilot program and will expand globally by 2020. As part of the company’s sustainability plan, RESOURCED encourages customers to recycle their clothing and shoes and give them a new life. In exchange for bringing in five or more items to any GUESS, GUESS Factory, G by GUESS or Marciano store in the U.S., customers will receive 15% off a full-priced purchase in-store or online. Together, we are committed to creating a more circular future of fashion. Please visit www.Guess.com/Resourced for more information. Today, the door is opened for a joint take-back initiative of the French ladies’ fashion brand La Maison 1.2.3 and I:CO. As of now, customers can bring in their disused clothing at all 1.2.3 branches in France, Germany, Belgium and Switzerland and receive a voucher of 10% on their next purchase in return. The partnership of 1.2.3 and I:CO helps to reduce the amount of textile waste and save resources. Still wearable textiles get a second life; those that are not wearable anymore are properly recycled to become new products for other industries such as insulation material for the automotive industry, cleaning cloths or paint substrate. To measure the effects of sustainable concepts on the environment, I:CO cooperates with the Swiss initiative WALDB (World Apparel & Footwear Life Cycle Assessment Database). With the help of its partners, WALDB collects data about the value chain of clothing and footwear in the fashion industry to make the product life cycle of a garment clearly visible. It is the goal to optimize the ecological footprint within the value chain on the basis of these data sets. With this analysis, conclusions can be drawn about the effect on the environment. The data contains all sectors, from the materials used to the supply chain. For I:CO, this partnership is another step towards improving sustainability in the fashion industry.